This is a guest post from Sok Verdery, CEO of CouponShack.com. CouponShack.com, a leading coupon site that helps consumers save money and get the best deals in their favorite stores, recently completed a survey to determine consumer’s vacation travel plans this summer. Interestingly, the survey demonstrated that the majority of people (66%) are continuing to plan summer vacations despite the economic downturn. That’s good news considering that most of us are feeling the need for a change of pace and a little summer fun. While Americans are still planning to travel, the majority (68%) of these vacationers are adjusting their plans to save money, and you can too. Internet sites like ours help you connect with great deals online that will save you money on everything from airfare and hotels to clothing and cameras. Below are a few tips that will help you save money on your next vacation. The CouponShack.com survey revealed that 32% of travelers will vacation in their home city and 38% in their home state. Before packing up the car, don’t forget to check for local deals that offer programs like gas cards online. Many grocery stores, and banks offer gas cards with promotional deals or as a spending reward. Go online for travel coupons. CouponShack.com has seen a 95% increase in demand for travel coupons in the past six months. You can save on brand name hotels, flights, hotel and flight packages, resorts and more. Use your social networks to save money. Social networking sites like Facebook, LinkedIn and Twitter give us instant access to global knowledge. Local citizens can help you avoid tourist traps and save you money. If you can be flexible with dates and locations, you will have greater options for savings. You can save hundreds of dollars often by simply traveling on a different day. If you are a spontaneous traveler, you can also take advantage of immediate travel deals and coupons. Sign up for e-newsletters and/or alerts from travel sites such as Kayak or TravelZoo, hotels and airlines. Many sites also have hot deals of the day, so bookmark your favorite sites and check for deals that you can use. Hotels, retailers and others may offer you discounts just for following them on Twitter. You can also use Twitter to broadcast your travel questions and quest for deals. Take advantage of discounts through work or memberships like AAA or AARP. Your employer or club may have special discount deals with amusement parks, hotels, car rental agencies or airlines. Visit your financial institutions’ websites. Your bank, credit union or credit card company may all offer discounts on travel and accommodations. If you participate in rewards program, you can trade your reward points for travel accessories, spa treatments, or discounts on local attractions. Comparison shop before you leave home. Look for deals in your destination area and print coupons to take with you. You can save money on dining, clothing, and even souvenirs. One size fits a family. Families can save money with all inclusive deals. Many locations offer combo deals that will save you money. Plan ahead to take advantage of early booking discounts. Early planning can save you a bundle. If you can’t unplug, check wireless cards for savings. If you need to combine a get away with work, compare your internet options before leaving home. You may save money and time with a broadband card. Surf for deals and coupons on travel accessories. You can save on everything from eye masks to shampoo by surfing online. Travel later in the summer. August and September are the off-peak summer travel months. You can find deals on everything from summer clothing to airfare during these months. If you’re willing to brave the heat, you can get great deals in warm weather states like Arizona and Hawaii. You deserve a break this summer and with the help of technology, you can have it at a discount! By making use of the internet, you can connect you with deals, discounts and even inside tips that will help you plan the vacation you deserve on a budget that you can afford. CouponShack.com is the leading coupon site that helps consumers save money and get the best deals at their favorite stores. A stop at CouponShack.com before you shop lets you get the most for your money and your life and can save you hundreds of dollars along the way. This is a fantastic list of tips, that goes beyond what I normally read. I’ve used a few of these techniques myself, like planning trips on felxible dates, but I’m definitely going to start doing other things, like using Twitter to find good deals. As someone who has to travel far to see family, saving money is really important- we can’t cut travel out of our budget, so we have to work to make it affordable! What are your best tips for saving money on your vacation? We use my husband's business trips as an excuse to travel. He gets sent to conferences and other companies 3-4 times per year. He asks his work's permission – and so far it's always been ok. They pay for the room, his plane ticket and/or rental car, and 50% of the meals. We leave a few days early so we can explore the area before dh has to do his business-type stuff – we usually buy some of his parent's timeshare credits for this. But, we don't have kids or livestock yet – our parents babysit our cats and dogs for free. .-= Kristin´s last blog ..Summer Flowers A’blooming =-. 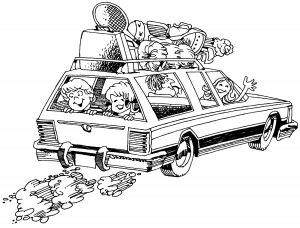 We will be traveling in state this vacation and staying with family members.We have also pushed back the travel time until early August.This is not so much for the cost but the somewhat lighter traffic,that we would experience now. So we fit the profile of the article fairly well. .-= Jon´s last blog ..RockResorts,Colorado =-. Great tips. I could not agree more with the family tip and all-inclusive resorts. These type of resorts not only save you money, but also reduce stress for the family. Next post: Is Frugality a Full Time Job?